Clearly, Warren Haynes has a problem choosing between bands. 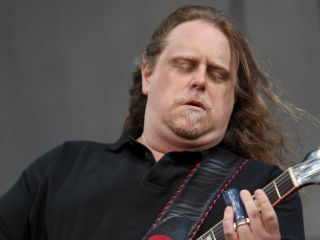 The revered guitarist not only leads his own group, Gov't Mule, but since 1989 he's been a member of The Allman Brothers Band. And if that weren't enough, he's plays with The Dead (remaining members of The Grateful Dead) whenever they're in action. So when MusicRadar asked the three-band picker to name his favorite, The Beatles or The Rolling Stones, Haynes gave the kind of answer one might expect from a musician whose influences are as disparate as they are numerous. Before he tackled that burning question, however, we put to him a few questions from MusicRadar readers. Haynes was more than happy to hold forth. Erictheweary notices some reggae influences on your new Gov't Mule album, By A Thread, and wants to know if you're going to explore the genre again in the future. "The song Steppin' Lightly has some reggae in what (rhythm guitarist) Danny Louis is playing, and the song Frozen Fear has a little bit. But it's nothing something we think about in a conscious way. I think there's been a bit of a reggae vibe on a few songs on all our albums, but it's never been overt. "I am a big reggae fan, however, and always enjoyed it when bands like The Stones or The Clash incorporated it into their music. They always did it in a cool way, and they kind of made a statement in doing so. With Gov't Mule, we approach it on more of a song-by-song basis." Timothy asks the question, Have you ever had the temptation to just scrap your setlist and simply roll with the vibe on stage? [laughs] "Well, we already play without a net at any given show. The setlist is largely drawn up around the different guitars I play on stage - I use so many different tunings, and it would be a nightmare for my guitar tech, Brian Farmer, if I sprung a bunch of surprises on him. "We do get away from our setlist quite a bit, though. I love the concept that Timothy is thinking about, but I also think there's a certain spontaneity to writing up a set an hour before you have to go on and seeing if it'll fly." Aaron asks, Who would you consider to be the biggest influences on your playing? Also, can you cite any specific techniques you've picked up from watching and listening to them? "Whoo, boy...This could take a while. You know, there have been so many people who have been huge influences. I would say the first three, speaking chronologically, would be Eric Clapton, Jimmy Hendrix and Johnny Winter." Next page: The Beatles or The Stones? "From there, I discovered all the different great rock guitar players from that era. I became a big fan of The Allman Brothers, of course. After that, I grew to love the work of Billy Gibbons and Jeff Beck - Beck is one of my all-time favorites, a simply amazing artist on the guitar. "I love so many people: Carlos Santana, David Gilmour, Steve Howe from Yes, John McLaughlin, Leslie West. Basically, I learned something from all of these players, but then I'd go back and read their interviews and check out the guys who inspired them. "In doing so, I got turned on to the less mainstream jazz and blues guitar players like Wes Montgomery, Charlie Christian and Django Reinhardt. If you ask me, the work of those three artists might never be surpassed. And of course I've been inspired by Freddie King, BB King and Albert King immensely. Everybody I've mentoned has helped to shape my style in various ways. There are moments where I'll pay tribute to any given player in a solo, but I don't try to emulate anybody; I try to make sure to be myself at all times." Jennifer asks, What is your favorite song to perform live? "That's a good one, and the answer can vary on a nightly basis. It can come down to where my head is at during a particular show, but usually it rests on how the rest of the band is performing. Usually there will be several songs during a concert that we interpret extremely well, and those will be my favorites. The next night, it could be totally different songs. So I don't have a favorite song per se; I like all our songs and I'm happy when I hear those two or three that really stand out." And finally, MusicRadar has that all-important question: The Beatles or The Stones? "The Beatles and The Stones! I choose them both because I can. [laughs] Growing up, I listened to The Beatles more than The Stones. That was my personal choice. See, I'm a great fan of melody and well-crafted songs. It's a simple fact: to have a great band, you have to have great songs. Period. And without a doubt, The Beatles had a staggering amount of great songs. "I have always maintained that I would rather hear a great song performed by an average band or singer than a virtuoso artist playing a bad song. Not that this was ever the case with The Beatles - they were wonderful singers and musicians. But you know what I mean - the song's the thing. Has to be. I have no tolerance whatsoever for bad songs. "Later on, I started listening to The Stones more and I came to realize that their catalogue, too, is flat-out undeniable. Their body of work from a songwriting standpoint is unreal, and they probably don't get the credit that they deserve when you compare them to The Beatles. "So I have to pick both bands. If I were on that proverbial desert island and could only take a Beatles record or a Stones record, I don't know what I'd do. That's be a tough call, man."